At last a wet morning when I can't go out or garden so I've actually got my inks out and created something!! This is my 19th postcard for the Craft Barn's Quotes and Lyrics Challenge where the words are PATIENCE and/or BETTER. This quote by Herman Melville appealed to me - I don't look what others have made or the words they've used till after I've finished mine. So my choice is original (well in my head anyway)! 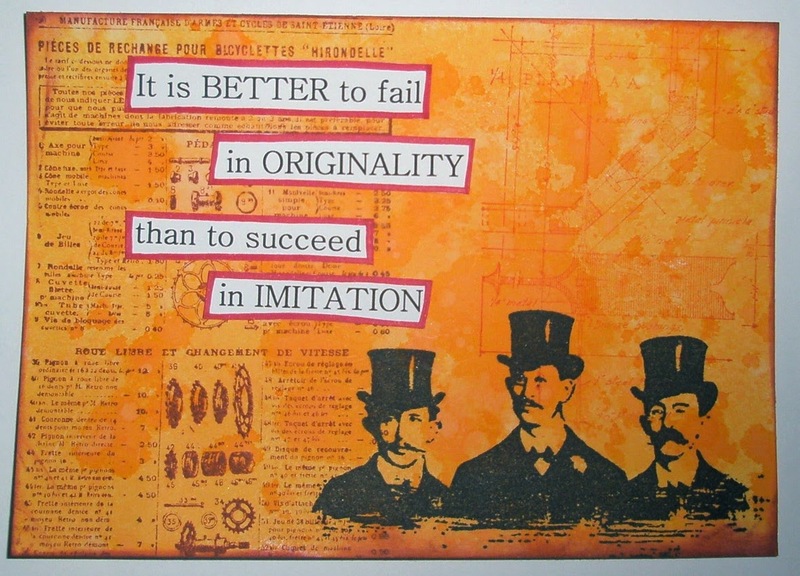 I had a rummage through my stamps and decided to use Tim Holtz's Steampunk set with the 3 men as Inventors. The background is sprayed with Oak House Studio's Citrus Orange Ink in a Bottle and the stamping is Fired Brick and Pumpkin Pie Pigment Inks with the Inventors in Onyx Black Versafine. Well that's one piece done - now I have week 17 and 18 to catch up with and about 5 weeks of journal pages to do. Not sure what colour my fingers will be by the end of the day!! Thanks for popping by and for any comments you leave - they're very much appreciated. Great quote, and background, and I've got that stamp set too - love it! Great post card, love the background. Like the quote, too. Lovely postcard. Stamps go well with it. I like everything about your card, the color, the background, the steampunk men which I think fit very well with the o so true quote. Great colour contrast between the orange & black. Great page, the colours are striking and I love the Steampunk men image! Another fabulous card, love the background and stamps used - great quote too. That's a wonderful quote and a gorgeous page. Great quote! I really like how you illustrated it with the inventor men! I've always admired that stamp, from the first time I saw it. You paired it well with the quote and the gorgeous background. A perfect choice of image for your quote. You've created a lovely background.